Panelists Dale Minami, Nicole Oshima and Traci Ishigo. 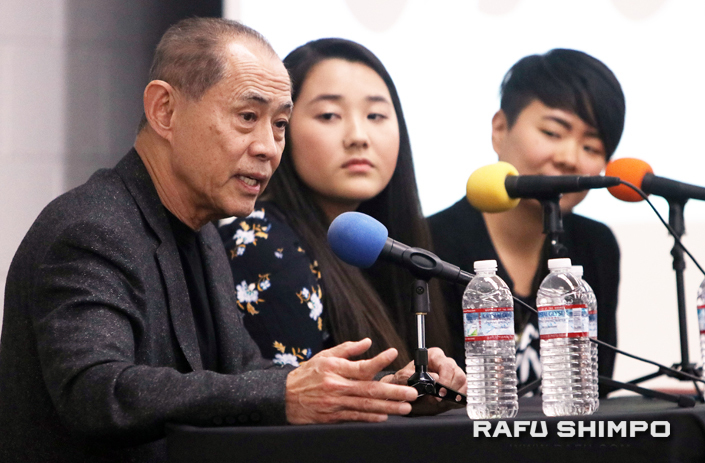 Following is Part 2 of a report on the 2019 Day of Remembrance program held Feb. 23 at the Gardena Valley Japanese Cultural Institute. Jon Osaki’s documentary “Alternative Facts: The Lies of Executive Order 9066” was screened, followed by a panel discussion. Although Minami is well-versed on the subject, he was impressed that Osaki tracked down and interviewed descendants of wartime officials such as Edward Ennis, director of the Department of Justice’s Alien Enemy Control Unit, who said at the time that the incarceration was wrong, but was overruled. “And when we got to understand our own history, we started to learn about what happened in these prisons and the incarceration of our own parents. Then I finally read the Korematsu, Hirabayashi and Yasui decisions in law school and they were treated as abstract principles. There wasn’t anything that had the human drama or the loss of lives, broken homes, lost dreams, any of those. Vigilant Love is focusing on Countering Violent Extremism (CVE). “It’s a policy that was actually started under the Obama Administration … This is a program that comes from the Department of Homeland Security and is … very similar to what we saw happening to the Japanese American community,” Ishigo explained. One criticism of the program is that it targets Muslims as potential threats for simply practicing their religion or being politically active. Minami cited the legal precedent of bans on Chinese and Japanese immigration in the 19th and 20th centuries. “The massive racial profiling of Muslims as evil and its simple connections are this. These actions are taken against some marginalized group that is not well understood, that are people of color and are generally politically powerless. The film included a quote from Col. Karl Bendetsen, one of the architects of the incarceration, who claimed that Nikkei were not behind fences and could go wherever they wanted. Another echo of history is talk about changing the 14th Amendment, which guarantees citizenship to anyone born on U.S. soil, Minami said, noting that Earl Warren, as governor of California, advocated stripping Nisei of their U.S. citizenship. On the subject of children being separated from their parents at the border, Ishigo said that Japanese Americans experienced similar grief when Issei community leaders were picked up by the FBI immediately after Pearl Harbor and separated from their wives and children for months or years. Ishigo recommended “having shared space together to build actual relationships where we can practice that empathy … or have an opportunity to understand what are people going through, because it’s really easy to be insular … For us as Japanese Americans, how do we continue to apply what’s happened to our community with other people? Yusra Khafagi spoke on behalf of CAIR. Yusra Khafagi, an immigrant rights advocate with the Council on American Islamic Relations, shared her reflections on attending the Manzanar Pilgrimage last year. 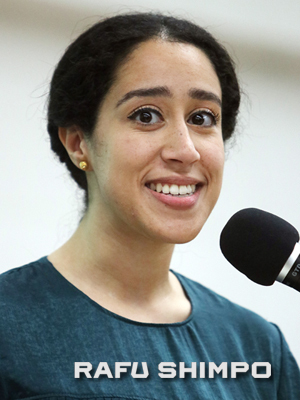 “The bus ride was my favorite part of the pilgrimage,” she said. “I got to bond with Muslims and Japanese Americans and we got to share our stories of immigrants. We got to address misconceptions and we listened to spoken word by Kurt Ikeda, a community organizer that I had the honor of organizing the trip with. “One of the guests shared her story of incarceration. She had been living in L.A. when E.O. 9066 was put into effect. She, her mom and her siblings were sent to an incarceration camp in Arizona. Her father was sent to another incarceration camp and as a toddler, her family was torn apart just as families continue to be torn apart today by manmade borders and policies such as the Muslim ban. Remembering that her mother went through hard times as an immigrant from Egypt in the 1980s, Khafagi said, “From a young age, I had always wanted to be involved in doing civil rights work, but today I share these memories with you so that we remember the strength and resilience of our people. You have overcome … poverty, discriminatory laws, and so much more, and you’ve done it through love, sacrifice, determination, and by supporting one another. The program, emceed by Alvin Takamori of GVJCI, included a display of camp-related artwork by Mary Hatsuko Higuchi and Don Hata, and literature tables staffed by volunteers from the Manzanar Committee, Tuna Canyon Detention Station Coalition, Okinawa Association of America, Little Tokyo Service Center, Little Tokyo Historical Society and other community organizations. Food was provided by Gardena Bowl and @Home Kitchen. Among the officials in attendance were Rep. Maxine Waters and her aide Hamilton Cloud, Assemblymember Al Muratsuchi, former Assemblymember Warren Furutani, State Sen. Steve Bradford’s aide Nital Patel, Gardena Mayor Tasha Cerda and City Councilmembers Rodney Tanaka, Mark Henderson and Art Kaskanian, and Torrance City Councilmember George Chen..